Sole/Ride: The sole of the Endorphin Racer 2 has been updated with Saucony's EVERUN midsole material in the forefoot. The heel remains SSL EVA with PWRTRAC outsole material. This results in the forefoot having a less harsh feeling than previous and a little more responsiveness. Being that EVERUN is far firmer than Adidas Boost, the midsole feels more uniform that a shoe like the boosted Takumi Sen 3 (REVIEW). 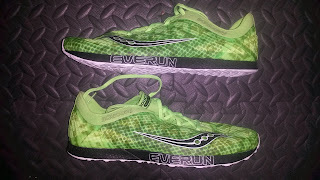 This shoe will tend to work better for individuals who land farther forward (mid/forefoot) as the lack of EVERUN in the heel can lend to feeling a harsher landing for heel strikers. 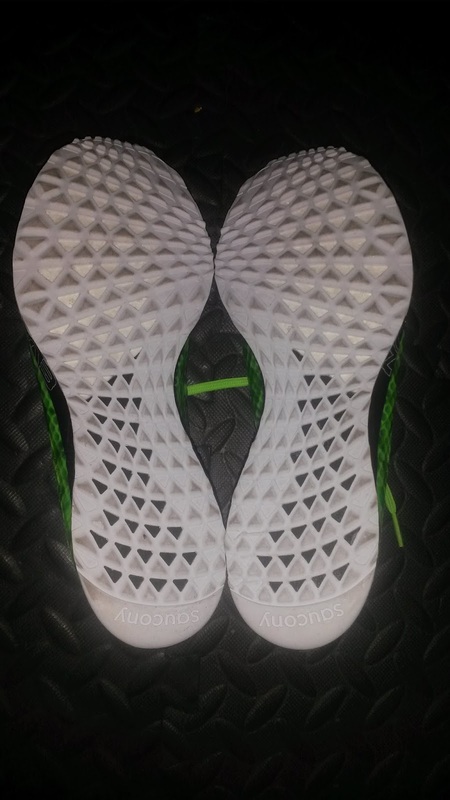 However, there is a little more midsole material than previous (2mm increase per Runningwarehouse) which gives a little more protection for a racing flat. The Endorphin Racer 2 has a 0mm drop and weighs 4.6 oz per Runningwarehouse.com. 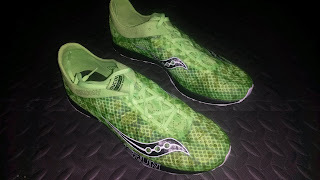 Despite the almost ounce weight increase, this shoe is still one of the lightest racing flats on the market. This is definitely a shoe I would use for either the track or road 5ks. Some people may be able to handle this for 10k but I would not use this for anything beyond that distances unless you are very used to training in minimal shoes. 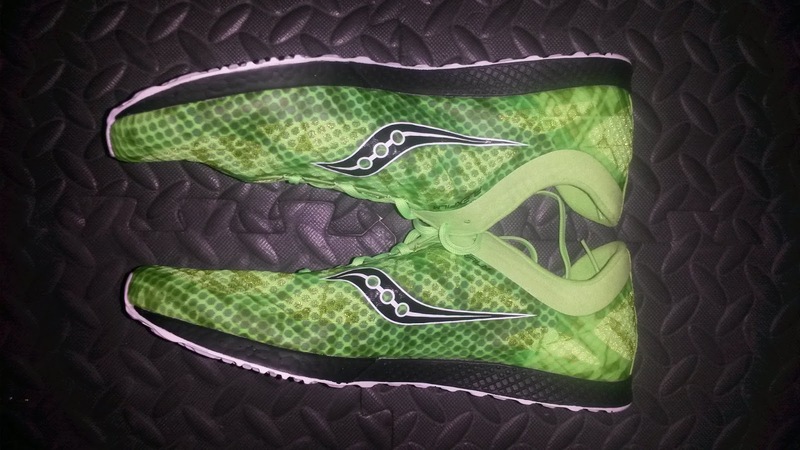 The outsole seems fairly soft and being a 4.6 oz racing flat will likely not last the traditional 250-300 miles. I have not put enough miles on this pair yet, but I would not expect these to last any longer than 150-200 miles at most for the general public. You are definitely paying for the lightweight, not durability with these racers. On the track these feel awesome as a fast and less aggressive track spike with the lack of a spike plate. However, the EVERUN in the forefoot gives a good amount of pop without being too aggressive. On the road, these shoes feel like spikes. 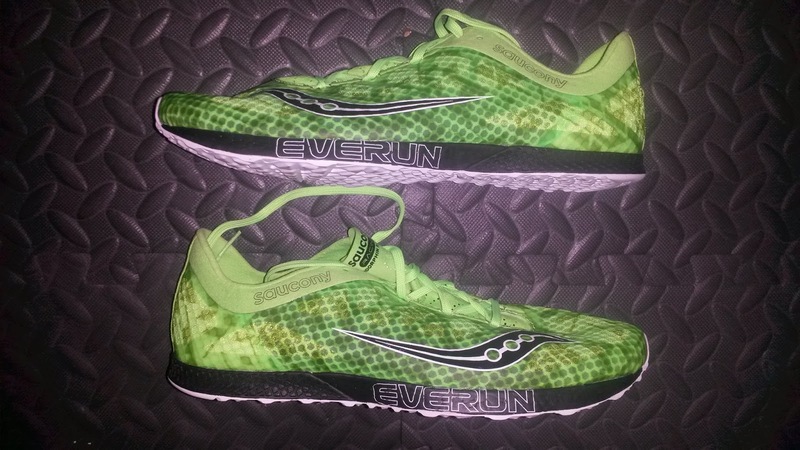 The EVERUN in the forefoot seems to react well with the firmer surfaces and feels best at high speeds. This is a shoe I would definitely stick to using on road or track as the outsole is not something I would be comfortable taking on trails. Upper/Fit: For a racing shoe, the fit is fairly high volume but medium width for a racing flat. I was concerned looking at the shape of the sole that the forefoot would taper fairly quickly, but found the upper to have a decent amount of room. Almost too much room for a racing flat as I had to cinch down the laces fairly tight to get the fit I wanted. Wearing a thin pair of socks, I would probably prefer to go a half size down (size 9.5 from my normal 10) as I prefer having my racing flats fit very close to the foot. That is a personal preference and others that like a bit more room should be pleasantly surprised. 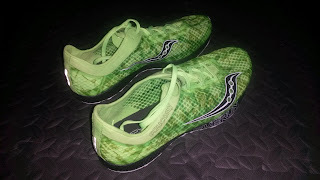 The additional room may also be from Saucony's flexible and very comfortable upper material. The upper uses similar materials to Saucony's track spikes, so it is very smooth against the skin. I did many track races in the Saucony LD 3 and preferred to wear that spike sockless as the upper was smooth and did well against the foot. 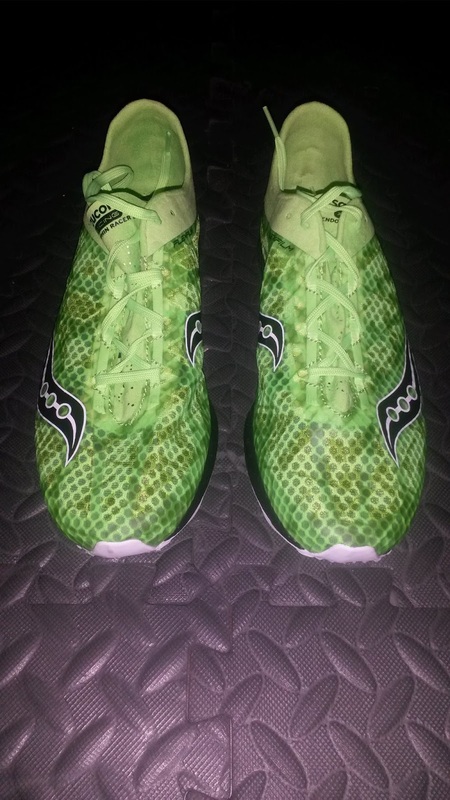 This upper is similar, but given that it has a "track spike" like feel, I again would prefer going a half size down. Others may have different experiences to due the variety in human foot shape, so this is definitely a shoe I would try on before buying. Thoughts as a DPT: There is a great deal of research on the importance of the balance between weight and cushioning for efficiency that I will not discuss here. However it is important to note that a lighter shoe does not always equate to increased performance as the body must compensate more for shock absorption rather than create propulsion the less shoe is present. What weight is the weight that the human body can handle? It depends on many factors. Generally an individual that can shock absorb well will be able to handle firmer and more minimal shoes. Those who cannot shock absorb well (who may tend to run more "stiff") may prefer more cushioned shoes. Your "shock absorbing" abilities come from the eccentric loading abilities of your muscles. Eccentric motion involves a muscle being lengthened while under load, the lowering down of a weight during a bicep curl being a prime example. This type of motion tends to produce higher muscle forces and requires a great deal of strength and motor control. Since the landing phase of running gait is mostly eccentric, it is no wonder that many running overuse injuries stem from issues during loading response. When the muscles are weaker, people tend to land with straight joints (extended knees) which is a movement strategy to load the joints instead of overtaxing the muscles. This is fine short term, but long term causes excessive loading forces on the joint surfaces and eventually set the individual up for conditions like osteoarthritis. This is a common cause of various forms of knee joint pain and is why strengthening typically is good for many of them (this obviously depends heavily on the root cause of the patient's pain). Teaching people to load muscles (which are meant to recover fast) rather than joints is important (depending on the population obviously)! This variation in shock absorbing abilities can be worked on (which I will delve into in a future post) but is one of the many variables that accounts for differences in racing flat tolerance. Some people will be able to handle races up to the marathon in something like the Endorphin Racer or Saucony Type A6 (which I have seen) while others will need a lightweight trainer like the Kinvara or Adidas Boston (also a frequent marathon racer I have observed) or a traditional trainer. You have to find what works for you. Recently I have enjoyed racing in the Streak 6, which is supposed to be a long distance racer. However, it has done well for me in 5k races. The Skechers GOmeb Speed 3 2016 (REVIEW), despite being a 7.2 oz racer, is a shoe I have gone into the 15:20 5k range in. So it is important to remember that you can run fast in a variety of different racing flat weights. You just have to find one that works for you and your biomechanics. 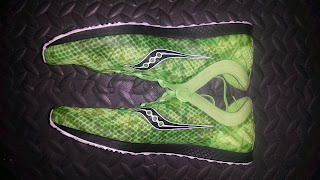 Conclusion: If you are looking for an awesome lightweight racing flat with slightly higher volume and a partial TPU midsole, then I would definitely check the Endorphin Racer 2 out. 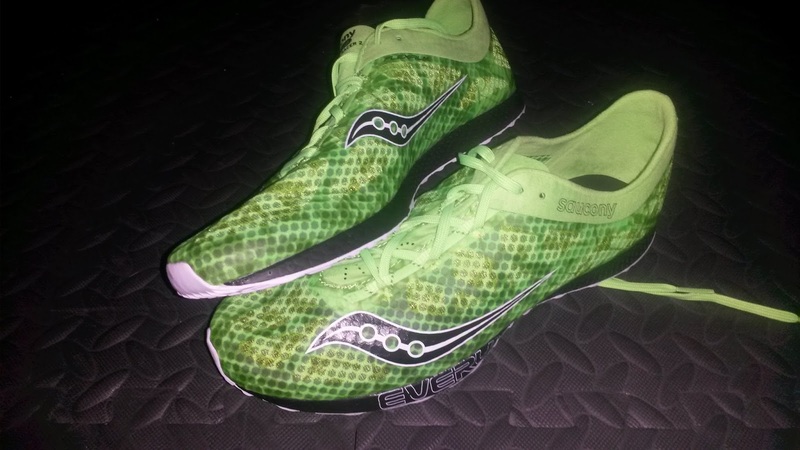 The forefoot EVERUN makes this shoe feel like a track spike for the road and will work very well for road 5ks and track workouts. 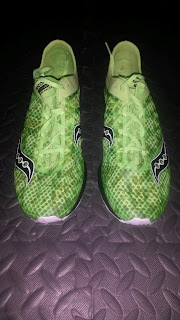 Right now this shoe is not quite what I am looking for in a racing flat (currently in the Skechers Performance GOmeb Speed 4) and will be returning these also due to financial reasons as I take the next step in my career as a Doctor of Physical Therapy (moving onto my orthopedic residency). Given the variation in fit, I would suggest trying these on before buying, but definitely suggest trying them if you are in the market for a lightweight fast racing shoe. As always, my views are my own. My blog should not and does not serve as a replacement for seeking medical care. If you are currently injured or concerned about an injury, please see your local running physical therapist. If you are in the LA area, I am currently taking clients for running evaluations. ***Disclaimer: These shoes were a personal purchase from Running Warehouse. I did run briefly on the road to test the shoes out but no more than what I would do testing shoes at a local running retail store. Due to financial reasons I will likely have to return these to Running Warehouse as I am currently an Orthopedic Physical Therapy Resident at Casa Colina (and funds are a bit tight as a resident). However, if they are provided to me by a company in the future, I will put them through their paces and report back fully.